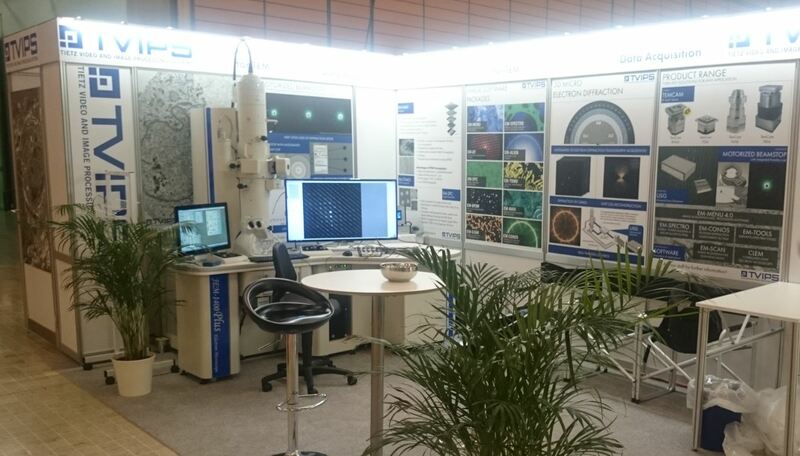 For high-end scientific imaging in Transmission Electron Microscopy, TVIPS were the first to design a new generation of CMOS based TEM cameras with active pixel sensors available in three different resolutions: TemCam-F816 (8k × 8k), TemCam-F416 (4k × 4k) and TemCam-F216 (2k × 2k). 8kTemCam-F816 is the first digital camera with a larger image area than standard film. With its impressive area of 128 × 128 mm² and ultra-high resolution of 64 megapixel the F816 surpasses the performance of photo plates. This camera opens up extraordinary possibilities for high throughput applications such as single particle data collection or screening of sections which require rapid acquisition of very large, high-resolution data sets. Since CMOS sensors show absolutely no blooming and have a high dynamic range they are well suited for acquisition of diffraction patterns. Now the second generation of F816 incorporates the latest 16 bit electronics. 4kTemCam-F416 & F416R are replaced by our latest 4k CMOS based Camera. See TemCam-XF416 for more information. 2kTemCam-F216 is TVIPS’s 4 megapixel camera, covering an image area of 32 × 32 mm². Having the same performance as the F816 and F416 with smaller sensor area, this camera is an ideal solution for limited budgets. The field of view can be extended by automatic software tiling. The readout is done simultaneously on 8, 4, or 2 channels respectively with 10 MHz. The typical readout time of a 4k × 4k area is 1 second, which represents an improvement of around 5× in comparison to up-to-date 4k multi-port CCD cameras. For a subarea of 2k × 2k, frame rates of 1.8 fps can be achieved. For even faster readout the sensor can be operated in the rolling shutter mode whereby no beam shutter is needed. In this mode, real time observation and data storage with frame rates of 8.5 fps on sub areas as large as 8k × 1k can be achieved. TVIPS optimizes the scintillator for individual demands. For high tension ranging from 40 kV – 60kV up to 400 kV, two standard types are available: optimized for high resolution or for high sensitivity. On customer request, individual scintillators can be manufactured. For optimum performance, the Peltier-cooled CMOS sensor is located in a vacuum housing separated from the microscope vacuum. The scintillator surface is kept at room temperature. This design avoids contamination and allows the venting of the camera chamber without warming up the CMOS sensor. TVIPS has designed a special flange which optionally combines the TemCam-F816/TemCam-F416 with the FastScan-F114NX, a high-quality CCD camera operating at video rate (up to 30 fps). This camera can be used for real-time applications such as alignment, screening of the sample and in situ experiments.